Who's hungry for more Santa Clarita Diet? Here’s what’s happening in the world of television for Friday, March 29 and Saturday, March 30. All times are Eastern. 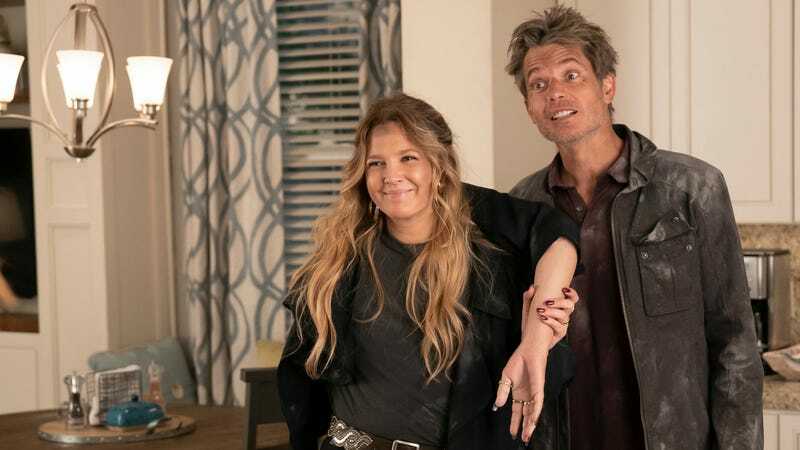 Santa Clarita Diet (Netflix, Friday): We’ve been craving more Santa Clarita Diet, and tonight, we’ll finally be sinking our teeth into another season of Victor Fresco’s bloody delicious horror-comedy. When last we left the Hammonds, they were one step closer to uncovering the mystery of Ruby’s Clams, and while we now know what likely triggered Sheila’s transformation, we have some questions: What exactly is Mr. Ball Legs? Who are Paul and Marsha, and what will their appearance mean for the Hammonds? What’s up with the Serbian Ball-Leg Knights? For better or for worse, Joel and Sheila are in this together ‘til death, or at least until the show’s demise. Andrea Reiher will be right there with them. Last season ended with Olivia and Ruby’s fate hanging in the balance, and while trailers for season 2 seem to have answered our questions, we’re eager to see how the kids deal with the fallout of the shooting... and what’ll happen now that Jamal is suddenly wealthy. Hanna (Prime Video, Friday): Based on the 2011 Saoirse Ronan action-thriller of same name, this TV adaptation expands the film’s original premise into 8 compact episodes. If that sounds a bit redundant to you, the series apparently deviates from its source material after the first couple of episodes, and writer David Farr—who helped co-wrote the film’s script—says that this adaptation is actually much closer to his original vision. While more Hanna sounds like it could be a good thing, reviews are pretty mixed, so it’s gonna be a judgement call. Laura Bogart will be making hers.